Zippy Zarp is a browser add-on, and it is supposed to help you get the best online deals. The program displays coupons, special offers, web banners, interstitial advertisements, and many other pop-up windows on different websites, including shopping websites, such as Amazon and eBay, and video streaming websites, such as YouTube. 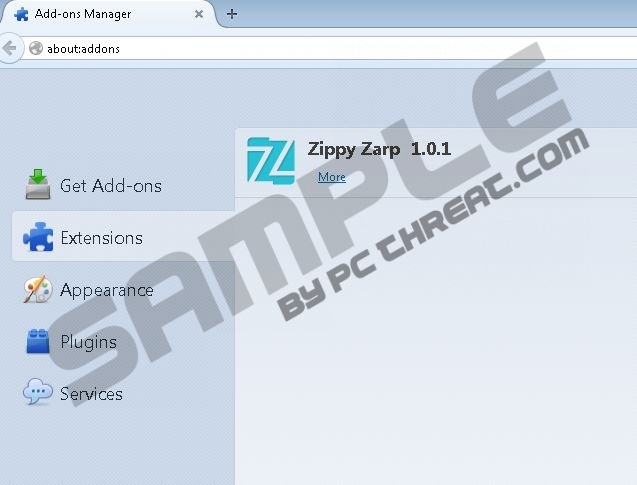 Zippy Zarp is one of the products of SuperWeb LLC, which is notorious for many identical programs, including Web Flipper, Bellaphant, Glomantron, and Mobeema all of which are ad-supported programs, and they are removed from the computer by powerful anti-malware programs. Zippy Zarp is no exception. If you want to rid your Internet browsers of those obtrusive ads, remove Zippy Zarp program the computer as soon as you can. Moreover, it is not enough to ignore Zippy Zarp pop-ups because this browser add-on is capable of monitoring your online behavior. Zippy Zarp records your IP address, browser settings, clicks, impression, search terms, browser language, and other information that you could help Zippy Zarp and third-parties to determine your browsing behavior. As a result, some targeted advertisements, i.e. advertisements based on you browsing preferences, may be displayed on the screen. If you have no intention of using the offers delivered to you, remove Zippy Zarp from the computer without hesitation. In order to prevent similar occurrences in the future, you should be very attentive when installing any program. Zippy Zarp is promoted on its official website zippyzarp.net but distributed alongside other free programs, such as media players and browser extensions. You should never install unknown optional programs because they may make a serious impact on the performance of the machine, not to mention the danger that may be posed by those suspect programs. When it comes to the removal of Zippy Zarp, we can offer you two options. First, you can try removing the program Zarp manually but manual removal does not guarantee that all the components of the program will be deleted. Another option is automatic removal. In order to have Zippy Zarp removed, you should implement a powerful anti-malware program. Our advice is to use SpyHunter because this program can remove Zippy Zarp and fight off various threats, including adware, browser hijackers, Trojan horses, and many others. If you want to be sure that Zippy Zarp is fully eliminated, use the scanner available below and invest in the program if any malicious files are detected. Quick & tested solution for Zippy Zarp removal.